Something that I think often is forgotten or basically not acknowledged as tattoo powers its way into the mainstream is that it’s nothing new. To the artists, the collectors, the tattoo historians and fans alike, this isn’t news. But to those people out there who criticise tattoo and the tattooed, I think it’s rather comical that their misconceptions are not based on any sort of logic, but rather puritanical ignorance that dates back centuries. After all, western civilisation’s introduction to the tattoo came quite some time ago, back in 1769 when a British explorer reported his impressions of seeing a young Polynesian girl tattooed by her elders. And although 1769 is not exactly recent history, the act of tattooing certainly didn’t somehow just begin around then. Tattooing is as old as some entire civilisations themselves, though such a fascinating link with history is seldom – if ever – acknowledged by those few today who claim that tattoos are little more than a passing trend, a mere act of rebellion or a frivolous fashion statement. Tattoos are here to stay and more importantly, tattoos have been here to stay for a long, long time. Sorry haters. Documenting the extent of these tattoos and the tattoo lineage, so to speak, is photographer Chris Rainier who has spent the past 20 years of his life travelling around the world, taking photos of various cultures and their tattoo traditions. Rainier has documented these stories in dozens of cultures across the globe. In New Guinea, a swirl of tattoos on a Tofi woman’s face indicates her family lineage. The dark scrawls on a Cambodian monk’s chest reflect his religious beliefs. A Los Angeles gang member’s sprawling tattoos describe his street affiliation, and may even reveal if he’s committed murder. 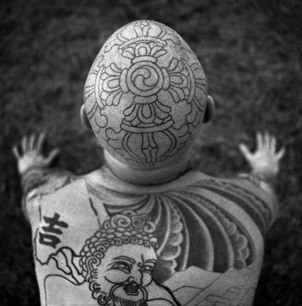 Whether the bearer is a Maori chief in New Zealand or a Japanese mafia lord, tattoos express an indelible identity. As fascinated by tattoo culture as Rainier is, it isn’t just the far flung places around the globe that attract his curiosity. He’s also completely intrigued by the current level of fascination that tattoos have found in places like the United States. For all his searching though, it seems that Chris Rainier understands exactly what is at the heart of the desire and appeal to be tattooed. Perhaps that’s why he’s so accomplished at seeking out tattoos and capturing their essence in his photographs. Rainier’s photographs from Indonesia will be used in the upcoming film Tattoo Odyssey, which highlights the history and use of tattoos from the Indonesian island of Siberut. It premieres September 26th on the Smithsonian Channel. I’m sure it’s a film that’ll be well worth your time.